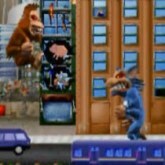 Description: In Rampage World Tour you can choose from three giant mutant characters including George (Ape), Lizzie (Lizzard), and Ralph (wolf) to play as. Scumlabs has exploded and these mutants have been released. Now its time to destroy the city. Eat people for health and hit anything that threatens your existence. This game is based on the 1986 classic, in my opinion it's much better though. Try your best not to die, keep up with the destroying but avoid getting hit. Game Controls: Enter Key = Start Button. Arrow Keys = Move. "J" Key = Punch. "K" Key = Jump. "L" Key = Kick.